Minimal access surgery (MAS) is frequently a keystone of best practice, offering diminished tissue trauma, post-operative pain and complications – and with all the benefits of accelerated recovery. Gaining hands-on training in this art is tricky, due to the intricacy and delicacy of the method. 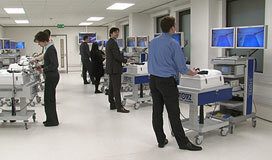 However, The Learning Hospital now offers a practicable solution with its range of new high-definition, interactive MAS teaching tools. 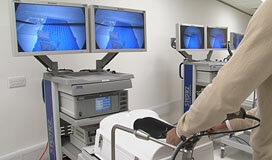 Featuring laparoscopic and endoscopic simulation trainers, the MAS centre has been designed specifically to facilitate group learning and supervision in this advanced technique. Visit the Booking & Room Hire page to enquire about prices and availability for The Learning Hospital's new MAS training suite. Cameras positioned above each MAS training station relay detailed images to a tutor's master station. 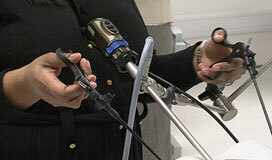 This enables experienced clinicians to teach and supervise groups of up to 10 trainees simultaneously. "This is a great opportunity to get a handle on minimal access surgery, using tools and instruments that feel and react just as they would via typical entry points".